The recent debates after celebrating ‘Quit India movement’ – have brought to fore – what we should be learning in Schools as History and whom we should rever ? – the freedom at midnight was gotten not free or easily but due to sacrifices of those martyrs who underwent untold sufferings and yet remained without ever getting in the limelight. The Nation should be learning the lives of such great people. Mother bid me farewell once, I will be back soon. You think they could have caught me? And the world would have watched how to fight … .. …. One would be moved to tears when we understand that this is in memory of the youngest revolutionary of this mother land who was just 18 years 8 months and 8 days old ~ and he was hanged 109 years ago ! 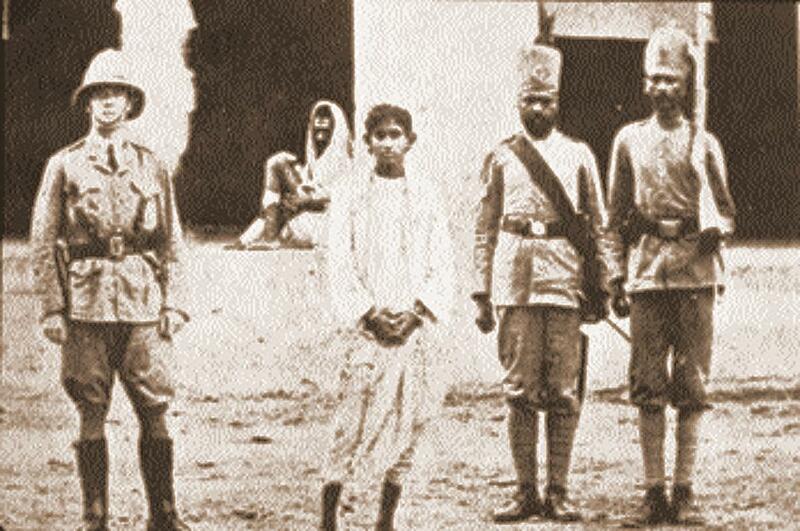 Khudiram Bose was born on 3.12. 1889 in the village of Mohoboni at Keshpur Block in Paschim Midnapore district of West Bengal. In 1902 and 1903, when Sri Aurobindo) and Sister Niveditarespectively visited Medinipur and held a series of public lectures along with secret planning sessions with the revolutionary groups; Khudiram was among the teenage student community of the town which was fired up with a burning inspiration of revolution. It was from then that Khudiram took his first steps towards choosing the path that would make him a boy-martyr. At the young age of sixteen, Bose planted bombs near police stations and targeted government officials. He was arrested three years later on charges of conducting a series of bomb attacks. In 1908, Bose and Prafulla Chaki were appointed to kill Muzzaffarpur district magistrate Kingsford. Douglas Kingsford was the Chief Magistrate of the Presidency court of Alipore, and had overseen the trials of Bhupendranath Dutta and other editors of Jugantar, sentencing them to rigorous imprisonment. The defiance of Jugantar saw it face five more prosecutions that left it in financial ruins by 1908. Kingsford also earned notoriety among nationalists when he ordered the whipping of a young Bengali boy by the name of Sushil Sen for participating in the protests that followed the Jugantar trial. On 30th April 1908, Khudiram threw a bomb at a carriage believed to be carrying Kingsford right outside the European club. But instead of Kingford, the carriage was occupied by the wife and daughter of barrister Pringle Kennedy, a leading pleader. A bounty of Rs 1,000 was also announced for anyone who could provide any information on Khudiram who walked throughout the night trying to flee, but was arrested in a railway station nearly 25 miles away. His partner, Prafullka Chaki had split up from Khudiram soon after the attack. On being intercepted by the police, he shot himself dead before he could be put inside a jail. Khudiram was unaware of Prafulla’s death at the time of his trial. Khudiram was eventually hanged to death on 11 August 1908. The morning after, Anandabazar Patrika reported how Bose died ‘cheerful and smiling’. To honour the 18 year old’s death, poet Pitambar Das wrote and composed the popular Bengali song Ek Baar Bidaye De Ma – a song that resonates the passion the young boy had for his motherland. It is also a song that always manages to bring a lump in one’s throat because of its sad, haunting words. The historical trial started on 21 May 1908. Along with Khudiram, two others were tried for assisting the boys in their mission—Mrityunjay Chakraborty and Kishorimohan Bandopadhyay, who had accommodated Khudiram and Prafulla in his dharmashala for their mission. The first man died during the trial, and subsequently the trail of Sri Kishorimohan was separated from that of Khudiram. Unlike the case of Vanchinathan, whose family was abandoned, eminent lawyers Kalidas Basu, Upendranath Sen and Kshetranath Bandopadhyay took up Khudiram's defense. They were joined later in the trial by Kulkamal Sen, Nagendra Lal Lahiri and Satischandra Chakraborty—all of them fighting the case without any fees, fighting for their country. Only during the later part of the trial Kudiram could know the death of his friend. He smilingly accepted the death sentence for the Nation. As per the legal system, Kudiram had 7 days time to appeal to the High Court. Khudiram refused to make appeal. On that day in August, Kolkata erupted in intense protest from the entire student community. The streets of Kolkata started to be choked up with processions all at the same time, for several days. The Amrita Bazar Patrika, one of the prominent dailies of that era, carried the story of the hanging the next day, on 12 August. Under the headline "Khudiram's End: Died cheerful and smiling" the newspaper wrote: "Khudiram's execution took place at 6 a.m. this morning. He walked to the gallows firmly and cheerfully – an established British newspaper, The Empire, wrote: "Khudiram Bose was executed this morning...It is stated that he mounted the scaffold with his body erect. Akin to Vanchi Maniyachi, Khudiram Bose Pusa station is a two platform station located in Samastipur district, Bihar, India with zero originating trains. It is 72 kilometres (45 mi) away from Patna Airport and 13 km (8.1 mi) from Samastipur Junction. A station named after the great martyr, who died so young ! Collated from a few sources on web – primarily Wikipedia. This post brought tears to my eyes. Independence is sure a blessing. And you are lucky if you are breathing in an independent nation.